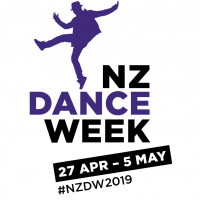 Dance Aotearoa New Zealand proudly present the NZ Dance Week 2019 Launch, at the Globe Theatre, Palmerston North. 27 April 2019, 2pm to 3pm followed by a dance showcase. With support from Sport New Zealand and Creative New Zealand. Original generation time 1.4165 seconds. Cache Loaded in: 0.0005 seconds.